After finishing the appraisal of the dagger, Nie Yan had begun to walk outside. Lowering his head, he took a glance at his skill bar. There were only two skills there: Stealth, and Vital Strike. A perfect Thief should have numerous skills piled up at their disposal. A Thief could make do without equipment; however, they absolutely could not do without skills. Of the several areas where Thief skill books could be farmed in the beginning stages of the game, Nie Yan knew all of them like the back of his hand. However, he would be unlikely to take the great effort and pain of farming them out. If a skill book could be farmed out, then it could also easily be bought in the marketplace. Hmm… were there any other places where I could find rare beginner skill books? Nie Yan smacked his forehead. How did I manage to forget that? With regards to classes such as a Thieves, if they wanted to possess sustainable fighting strength they would often select either Alchemy Crafting or the Bandage skill. Alchemy Crafting allowed a player to manufacture every kind of health potion, drug, etc… In the middle of a battle, a health potion—that could instantly restore lost health—was tantamount to a second life for a player. Afterwards when a battle was over, drinking a recovery potion allowed a player to quickly restore their health and throw themselves back into combat again. Thus, accelerating their training speed as well. As for the Bandaging skill, in comparison to a health potion, it was a bit lacking—the common Bandage skill could not be used during a skirmish. Nie Yan knew of a location where a rare skill, Combat Medic, could be learned. Unlike Bandage, it could be used while in combat. At higher levels, if a person wished to purchase middle- or higher-tiered health or recovery potions from the marketplace, their expenditure would be quite large. After all, their prices were quite costly—for most players, health and recovery potions were items they could only acquire by digging through the gaps between their teeth. Unless one were rich, the average player wouldn’t be seen commonly using health, or recovery, potions. However, Nie Yan was different—his head was filled with many ways to earn money quickly and easily. He didn’t need to worry about money. Later on, health and recovery potions were all things he could easily buy from the marketplace. Thus, it wasn’t necessary for him to waste his time learning Alchemy Crafting. However, if he learned this Combat Medic skill, it would greatly enhance his survivability. Thinking to this, Nie Yan suddenly had an idea. I’ll put that off for later. I should learn the Combat Medic skill first. Nie Yan spent two coppers and bought two Basic Underwater Breathing Pills from the NPC general store. Right after, he rushed towards Lake Rando which wasn’t too far of a distance from Tellak town. After passing through several Level 2–3 areas, he had met many players that had formed parties to hunt monsters. They often occupied a single region in their own area. Warriors, Paladins, etc… all these close-combat classes worked to draw monsters. Right afterwards, the Mage would unleash an unceasing barrage of spells towards these monsters. Some parties would even bring their own Priest. Most Priests didn’t currently have the Heal skill—their ability to deal damage wasn’t as good as Mages either. For the most part, they were dirty experience leeches. Despite this, every team still looked for a Priest as if they were a hot commodity. This was because if a team wanted to have any growth or development in the future, they absolutely needed to have a good relationship with their Priest. Lacking a Priest was the same as lacking an endless supply of health potions. As for Thieves, in the early stages of the game, many Thieves would be easily dumped by their team. However, Thieves were quite famous for their solo training speed. As long as they purchased all of the necessary skills they required, a Thief’s training speed would not be inferior to a Mage’s in any aspect. So, it wouldn’t be much of a loss if they couldn’t join a team. Level training in the various monster spawn areas was awfully monotonous and boring. However, these players could still chat with each other. Thus, the time would pass quite quickly when they chatted on idly. Nie Yan carefully passed through these areas where players were training because a lot of struggles would occur between players for certain training spots. If a player killed other players, they would receive a penalty with their names marked red. They would be barred from entering city walls as well. Having their names marked red meant other players could kill them without fear of recourse. Their loss of levels upon death would be even harsher, and every single piece of equipment would drop as well. Though, if that player killed monsters for a certain period of time, the red marking on their name would eventually disappear. Despite this, many players would still frequently take this risk for the sake of stealing another player’s equipment. Not hesitating in the slightest, they would kill others for their equipment, regardless of having their name marked red. In order to do this safely, they would often target strangers in the wilderness far away from any city, Thus, one must be very cautious when travelling alone. Lake Rando… this area was inhabited by Fishmen monsters. According to rumours, these Fishmen were the descendants of the ancient Wicked Naga. After countless generations, they finally developed into their current form. They possessed the body of a fish, and four limbs just like a human. The weapons they employed for attacks were their sharp teeth and the tridents they held in their hands. 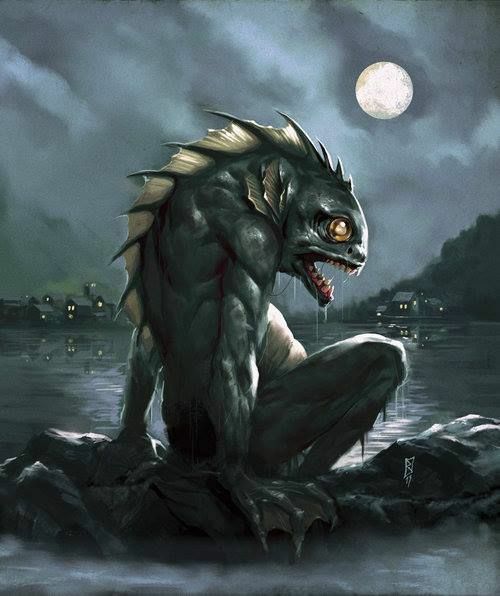 Fishmen were Level 3 monsters that heavily populated the area with their massive numbers. Furthermore, there was even a Fishmen village within the vicinity. It was necessary for Nie Yan to pass through the borders of the village to enter Lake Rando. Afterwards, he would need to swim through the lake to arrive at his destination. Situated by the lakeside of Lake Rando was the Fishmen village with its several hundred wooden huts scattered sporadically by the sandy edges of the lakeshore. This Fishmen village contained at least three hundred or so Fishmen, several tens of Fishmen Leaders, and two Elite Fishmen. If one wanted to clear this area, they’d need at least a thousand players or more. Just as Nie Yan was preparing to activate Stealth to bypass the Fishmen village, a system announcement rang out. Local Announcement: The Guild, Victorious Return, is planning to clear this location in three minutes. All players within the vicinity of the Fishmen Village, please depart immediately. Victorious Return? Nie Yan raised his eyebrow. In his previous life, he and the guild Victorious Return had a few run-ins and festivities together… Victorious Return’s people ran rampant and acted arrogantly. They’d clear the path and kill everyone in it whenever they wanted to. A long time ago, one of Nie Yan’s brothers killed three members from Victorious Return because he was discontent from the guild forcing him out of a training area. A bit of a grudge was pillared down with those from the Victorious Return, and all of the guilds went chasing after him. They threatened to have his brother slaughtered back to Level 0. Nie Yan’s and the others’ strength was still pretty weak back then, thus he could only hide deep within the ravines in the mountain range. He continued to level up and trained like a madman for over a month. Only when he felt his level had reached high enough did he dare to come out. Even then, he was still barely able to defend himself. In the end, he never dared to have a direct open confrontation with a big guild like Victorious Return. The feeling of powerlessness back then… don’t even bring it up. Nie Yan had just entered the game for less than a day. He still needed to gradually accumulate his wealth bit by bit. Immediately, he turned and ran towards the lakeside. As he looked ahead of him, he saw the clear waters merging with the reflection of the azure sky. The lake gleamed and sparkled as the sun’s rays illuminated the top of the crystalline clear waters. Victorious Return’s players had mobilized intensely and were surveying the area. There were many areas in the vicinity where one could discover the movements of Victorious Return’s people. They definitely did not come with few numbers. It appeared that they were preparing to begin their operation on the Fishmen village. The Fishmen village wasn’t an instance, but rather a spawning ground for monsters to congregate. These types of places would also frequently drop decent items. Nie Yan passed through a small grove of trees, arriving at about two hundred meters away from the lakeside. Suddenly, a ball of fire streaked through the sky, launching towards Nie Yan’s location. As the ball of fire flashed, Nie Yan’s line of sight shifted past the grove of trees. His eyes fell upon the body of an Elementalist wearing a red robe. The opposing player was a Level 3 Elementalist from Victorious Return! Mages were divided into three types of classes: Elementalists, Arcane Mages, and Holy Mages. Elementalists had the ability to control ice, fire, and lightning—their power was the elements. Arcane Mages were able to control arcane might and finally, there were the Holy Mages. They were the least selected class. Their skills were the most difficult to train in, but their power was definitely the strongest. They could cast and unleash the power of divine spells. The killing power of fire spells was the highest among the spells at an Elementalist’s disposal. By the time Nie Yan had noticed the fireball, it was already too late. 「Boom!」The fireball exploded on Nie Yan’s body. It tore through Nie Yan’s health, as his health bar plummeted by twenty-two points. When coming across a Mage, you either run up to them and engage them in close quarters combat or hastily run away. After confirming there were no other players from Victorious Return nearby, Nie Yan dashed towards the Elementalist named Violet Flame. A Mage’s strategy was to maintain as great of a distance from the enemy as possible and bombard them with magic spells. The Elementalist Violet Flame leapt back using the spell Flame Burst and cast Fireball once again. Afterwards, he turned around and fled in an attempt to gain some distance from Nie Yan. When facing incoming magic in a fight, players were usually able to dodge the spell by rolling. However, if they dodged the spell by rolling, they would undoubtedly give the opposing Elementalist the opportunity to gain some distance. Nie Yan directly confronted the Elementalist’s fireball and continued to charge forward. 「Boom!」The fireball exploded on Nie Yan’s body, causing him to lose twenty-seven points of health. Each time Violet Flame cast a spell, there would be a delay in the casting of the spell. There were some essential factors in casting magic. Gestures, language, material, and magical tools were all required in casting different types of magic. The requirements for casting different spell were distinct. Some only required for you to perform a chant to cast the spell. Some required gestures and others required chants, gestures, and materials—all of these components at once in order to cast a spell. Every spell had different requirements in order to be cast, and the casting time would vary as well. Casting a spell used syllables and gestures as units—one syllable per second and one gesture per second. Ten syllables formed into a set of syllables and ten gestures formed into a set of gestures. Syllables and gestures could also be layered over each other—meaning they could both be done at the same time. The casting time for the Flame Burst spell was two syllables and two gestures for a total of two seconds. If they hadn’t learnt a movement skill when casting the Flame Burst spell they would need to stay still for two seconds. Nie Yan took advantage of the time Violet Flame used to cast Flame Burst to press forward. Quickly, with a forward stab, he shaved off twenty-three points of health from Violet Flame. A Mage’s defense was extraordinarily fragile. Violet Flame leapt backwards. Promptly, he cast Fierce Flame Ring. Four separate flames appeared launching towards Nie Yan. Fierce Flame Ring only required one syllable in order to cast. At such a close distance, Nie Yan was simply unable to evade it. Thus, he could only suffer through, receiving thirty-nine points in damage. With a flick of his finger, he took out the Basic Health Potion from his belt and downed it. Violet Flame’s actions could be regarded as standard for a Mage. However, his movements were quite rigid and clumsy. Every Mage would tense up when a Thief neared them in close proximity. As the Fierce Flame Ring was flying through the air, Violet Flame took the opportunity to draw back. Nie Yan added many points into Dexterity. In terms of speed, Thieves were still quite remarkable. This time around, his speed gained him an advantage as he continuously wrapped around Violet Flame. He lunged out with two consecutive stabs causing Violet Flame to lose thirty-six points of health. Once more, Violet Flame cast another fireball towards Nie Yan. Conviction’s combat system counted three seconds per round, and any magical spell that took less than three seconds to chant would be uninterruptible unless the caster died. Even though it was a close combat battle, Violet Flame would still be able to counter-attack Nie Yan. Under Fireball’s high damage, Nie Yan was left with twenty-five health remaining. Violet Flame wanted to retreat back to pull some distance. Brandishing his staff, he began reciting another spell incantation. The fire elements rapidly began moving towards his staff and coalescing into a round mass. It appeared Violet Flame still had fifty-one health remaining. For the time being, he was safe because Nie Yan merely had twenty-five health remaining. As long as he casts another Fireball he could finish off Nie Yan. Following Violet Flame’s chanting, the fire elements rapidly gathered together as it raged and blazed forward. “Drop dead!” Violet Flame felt everything was now within his control—the flames from his staff illuminated the sinister expression on his face. Nie Yan was well aware of how dangerous his current situation was. He had already forced his way to Violet Flame’s side. Glancing at his rage bar, he noticed it was fully charged and matched the requirements for an enhanced attack. Nie Yan’s deep black pupils locked onto Violet Flame’s throat. Quickly, he maneuvered the dagger in his hand into a reverse grip. Nie Yan’s and Violet Flame’s body crossed paths. A streak of cold glint flashed past Violet Flame’s throat. A deep cut appeared on his throat as it split open with blood gushing forth. A damage value floated atop Violet Flame’s head. His eyes were deeply permeated with an unfathomable sort of expression. Never underestimate the explosive power of a Thief. When facing a Thief, never feel that you’re safe or secure, even if you occupy an absolute advantage… because in the very next moment, the one who ends up dead could very well be you. The light in Violet Flame’s eyes gradually faded.「Plop…」He collapsed on the ground, still unable to understand what had happened. How could a single Thief just suddenly burst out with so much damage…? Vital Strike… this skill’s damage is pretty good, Nie Yan thought. Nie Yan put away his dagger, then bent down to look through Violet Flame’s corpse. Soon, he retrieved a dropped equipment and picked up a Level 0 Intelligence +3 Bronze Staff. He estimated he could sell it for around ten or so coppers. “Chase! Don’t let him escape! Nie Yan had killed a member from Victorious Return. Such a large event was certain to attract the attention of everyone within the surrounding area. Six members from Victorious Return came from every direction and quickly rushed towards Nie Yan’s location in an attempt to surround him. Seeing this, Nie Yan made a mad dash towards Lake Rando. His running speed was quicker than most of the average players at his level. Soon, he rapidly gained some distance between him and the other players. Though, a Swordsman appeared right ahead of Nie Yan, barring his way forward. “You want to run? It’s not going to be that easy! Linear Slash!"